Truth be told, I’m happy if you drill an array of 1” holdfast holes on 3/4” centers on your workbench, but I get asked a lot about where my holes are. So here is my theoretical theory on this. I bore eight holdfast holes that help me deal with common sawing, planing and mortising chores. Each hole has a particular job to do. Now, I’m no Joel Moskowitz, but I did my best to sketch out the holes in the drawing above (click on it and it will expand). The first hole I bore is 7-1/2” from the front edge of the benchtop and a few inches forward of the face vise. This hole has two jobs. 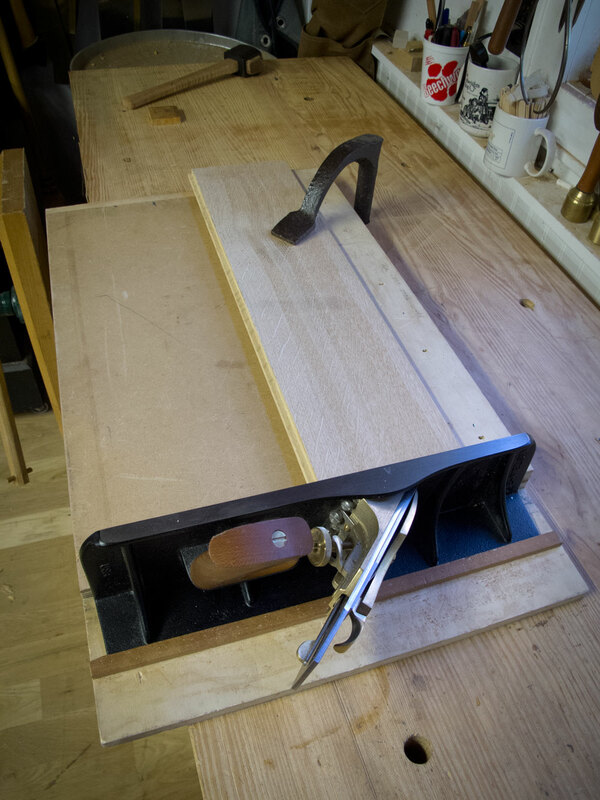 It allows me to hold my work down with a bench hook, which is of a fairly standard size. The key thing is that this hole should be behind the fence of your bench hook. Otherwise, it is fairly useless. The hole is also handy for mortising. 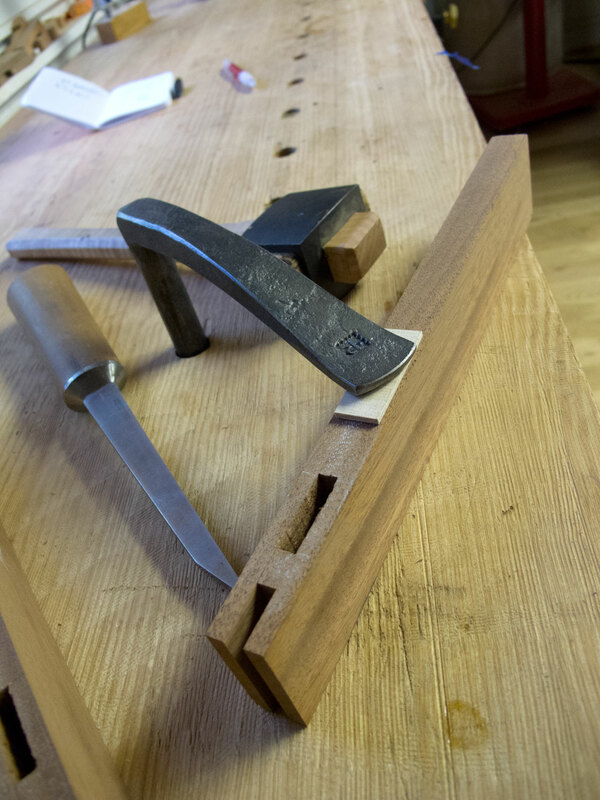 It is close to the front leg so I can mortise on top of the workbench’s leg and hold the work down with the holdfast. Likewise, I bore a hole that is 15” from the front edge of the benchtop and a few inches forward of hole No. 1. I use this hole to hold work down on my shooting board when I am trying to take that all-critical final pass (for most work on a shooting board I use my off-hand to hold the work). I usually use the holdfast to hold the shooting board down to the bench when it’s not being used on the final pass. 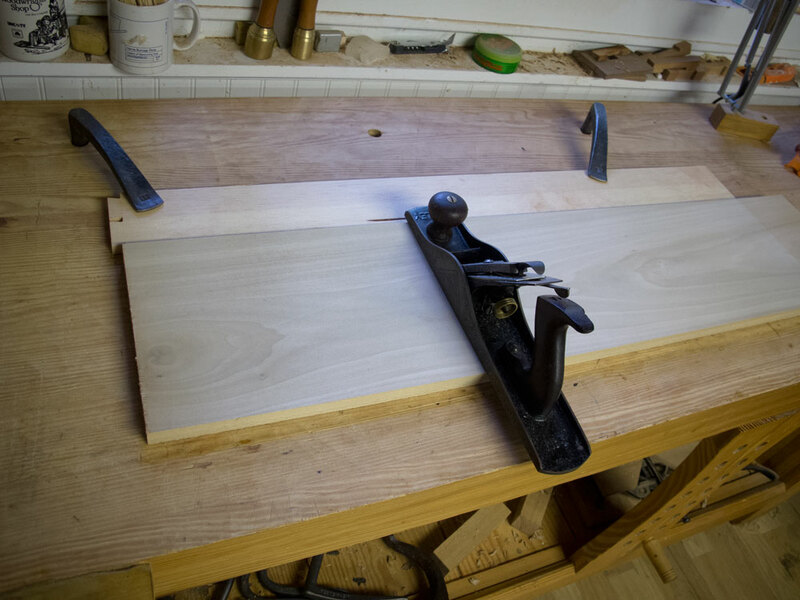 Then I bore a series of holes along the back edge of the benchtop – 3-1/2” from the rear edge is good. Where to locate the first hole? It should be behind your planing stop so you can clamp down a batten to plane up panels. For me, that put the hole 3” from the end of the bench. From hole No. 3, I measure 15” and put a row of holes on 15” centers down the length of the benchtop. These holes are used with battens for traversing panels. I use them constantly. With some benches, I add a few more holes in the top, but I usually wait until I absolutely need a particular hole in a particular place for a particular reason. YOU may be happy if I drill 1″ holes but my holdfast wouldn’t. Reblogged this on She Works Wood. This is a great post, thanks. Not so much for the specific measurements but for the hole positions relative to the radius of my holdfast(s), the depth of my bench hook, the position of my planning stop, and the depth of my shooting board, and how my bench is constructed (with an emphasis on “my”). This ties a bunch of things together that I kind of knew were related but hadn’t quite clicked yet. That sketch did it for me. Pictures, no matter how well they are done, can be confusing sometimes because they don’t show all the relationships and/or may differ from the text enough to seem contradictory. Well done. That’s almost exactly how I do mine, except I never thought about the hole down 3″ from the corner. 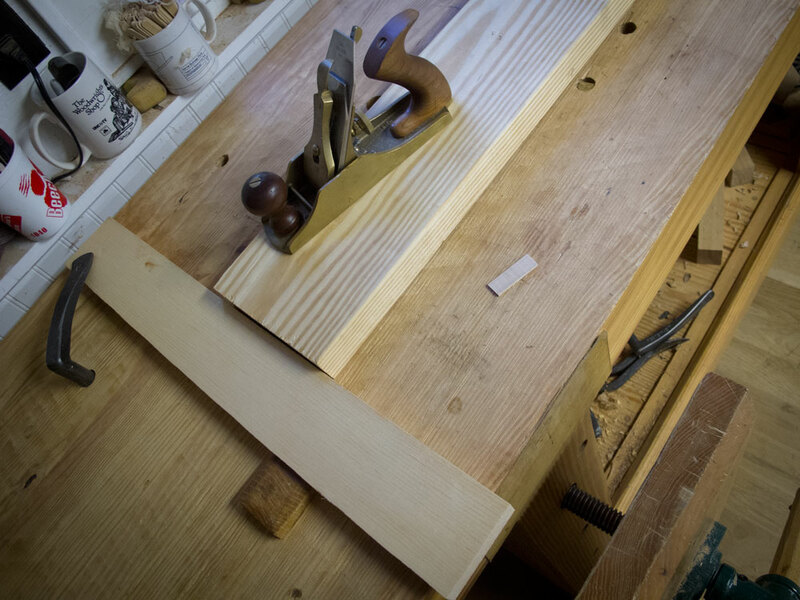 The way the oak planks are that form my bench top, it wouldn’t work without risking a bad split. Since I don’t have a planing stop, I guess I should make and install one or install a 9th hole for a dog in it’s place. A 9th hole ruins the joke though, what to do…. That is way more thought out than my feeble rule of thumb: put the holes two holdfast arm lengths apart. I appreciate the insight. I’d really like to use holdfasts on my Ulmia german style bench. Unforunately, my wife hates to see me endlessly modify things and forbids me to drill into it. This post might help to convince her that it’s resale value will be enhanced by a few well placed holes. Will this be covered in your 2-day bench video? No. It doesn’t use holdfasts. But this blog entry is all you need. How do you alter this layout for multiple holdfasts with varying diameters? 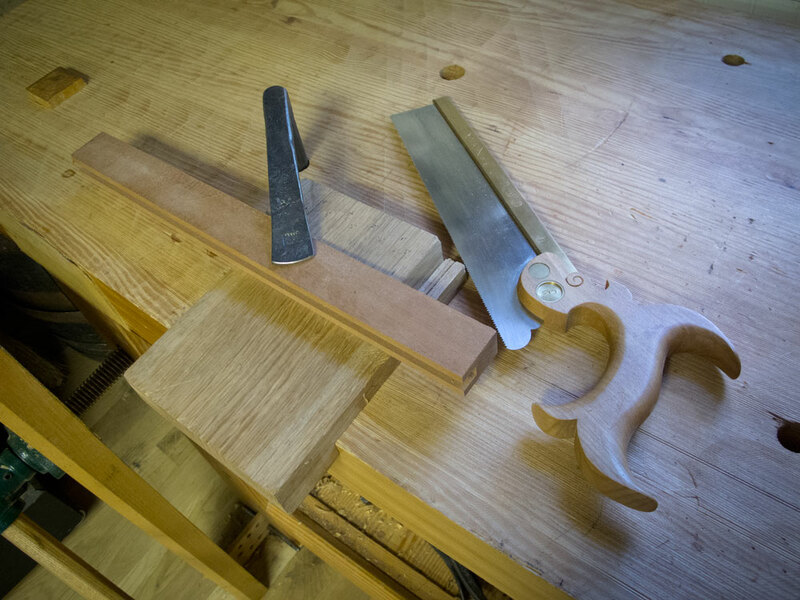 Peter’s Moxon, Roubo, and monster-Roubo holdfasts are 3/4″, 1″, and a reamed 1-5/16″ respectively. Where would you add the larger holes if you used one of the Roubos for larger stock? The second question: do you need the larger holdfasts for larger work, or are the Moxon holdfasts up for all challenges? This bench will use 1″ holdfasts, so there will be only one diameter of hole involved. I hope to have two holdfasts for this bench – one from Brian Anderson (who gave me an antique one) and the other from Peter Ross. Chris, what are the measurements for the three holes in the front right leg? Thanks. They are based on the reach of your holdfast — they are spaced twice the length of the beak. For the hold fast holes in the leg? In the picture, it looks like the distance between holes is about the same as the reach of a typical hold fast – around 7″ or 8″ apart, but not twice the length? Do you measure the first hole from the floor or from the top of the bench? Thanks Chris. I appreciate your time to answer our silly questions. Yes. That is the principle – twice the distance of the beak. In practice they are closer together as you can see from the photo. The top hole is positioned so the beak of the holdfast can easily grip the front edge of the benchtop. The lower hole gets a 30″-wide tabletop to a comfortable position for working the edge. The middle hole is equidistant between the others.